When it comes to stir fries, the most time consuming part of these recipes is the prep work on the protein, vegetables and aromatics. If you can prep these things before hand and have them ready to throw into the skillet, you can easily have this meal done in less than 15 minutes. In fact, the rice will probably take longer to cook so start on that first. I served our stir fry with a garlic & vegetable fried rice, using up leftover rice from the night before. In a large skillet, stir fry the pork in oil for 3 minutes or until no longer pink. Transfer pan to a plate, set aside and keep warm. In the now empty skillet, stir fry the onion, garlic and broccoli until the broccoli is slightly cooked through. Combine the cornstarch, broth, soy sauce/tamari, brown sugar and ginger in a small bowl. Stir mixture into the skillet and bring to a boil. Allow the sauce to thicken, about 2 minutes and return the pork to the skillet to heat through. Great recipe! Saving this one! 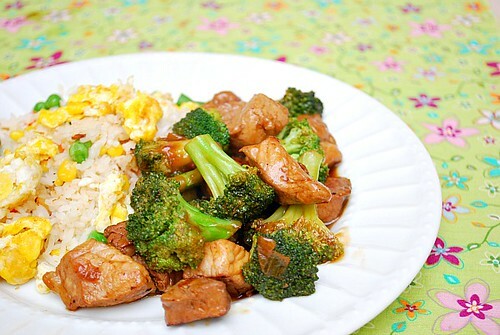 This looks like another tasty, easy Asian meal for those nights that we would have previously turned to Chinese take-out! I've made this recipe at least three times in the last two weeks. And the taste of this dish is really good. Actually, I shared this to my friend and he liked this dish too. This was quick and easy and very tasty. Thank you for posting it.